Time flies when you’re killing Nazis, but before the horrors and gaming cliches of WWII, there was WWI, or the Great War. In the year marking one century since that war started, we finally get a war story from that period that’s worth telling, but is it worth playing? 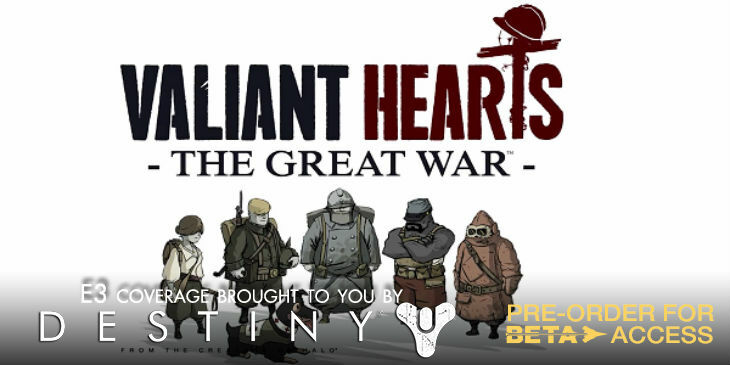 I’ve been following Valiant Hearts since it was announced. I loved the fact that Ubisoft was looking for actual letters, mementos and other artefacts from the time to bring the game to life. The art style looked brilliant and I was excited to see how the game would shape up – I got to play it, and it’s not exactly the game I was hoping for. I suppose I should have realised that the gameplay might not be up my alley, but I wasn’t expecting something that was so very different from what I wanted. But let’s start with the good. The game explores relationships, communication and meaning during a tumultuous time. The Great War was unlike anything that anyone had ever seen before, and thanks to the efficiency of the postal system (after some initial hiccups) most communication was done via letters. Valiant Hearts uses these and other tools to tell the stories of a variety of characters as they struggle to survive one of the deadliest wars, and help bring two characters back together. It is a deeply compelling story, and it might just be enough to carry the game. The art direction and music is enthralling, making the experience immersive an impressive. The characters are utterly unique and enjoyable, with a dog who ties it all together. I honestly fear for that dog’s life – I can only hope that he survives, and I have a vague hope that he is actually the game’s narrator. Then there is the gameplay. While the controls are fluid and the game runs easily, it truly reminds me of a point and click. During the demo, I couldn’t advance without making potatoes for the one captain. This involved going into a room, pulling levers and turning wheels until water, fire and potatoes were present in the right order. While it wasn’t particularly difficult to manoeuvre, it did get a bit frustrating at times. I know that there are fans of the genre who will be overjoys to hear that it resembles a point and click. I am also aware that the game simply wouldn’t work as a shooter, or platformer, or most any other genre. However, it seems to me that the focus is so strongly oriented towards the story and characters that gameplay has somewhat fallen by the wayside. Of course, that could just be specific characters. One other character that I played during the demo was also using some point and click elements, but was much more active. I can only hope that the variety continues across the character range to mix things up with the gameplay and keep people from finding the game as boring as studying the time period can be. Previous article The Legend of Korra is back for Book Three!